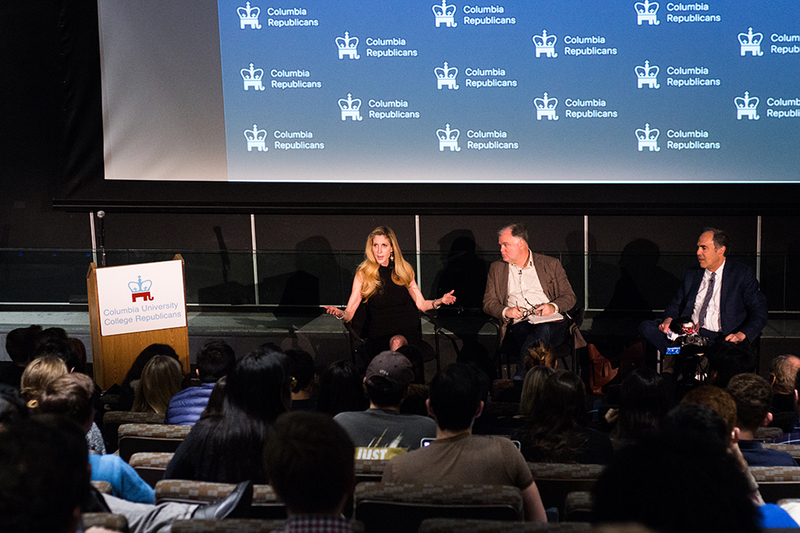 Conservative pundit Ann Coulter and political blogger Mickey Kaus spoke about immigration in Trump's America at a CUCR event on Tuesday. Conservative political pundit Ann Coulter and blogger Mickey Kaus examined what Trump’s America looks like, specifically discussing issues of immigration and income inequality at a Columbia University College Republicans event this Tuesday that drew protests from students and outside groups. Kaus, a Democrat, was brought to the debate at Coulter’s request to offer a balancing viewpoint, though their opinions overlapped on the issue of immigration, which they both criticized heavily. About 10 protesters attended the event itself and voiced their concerns with this procedural change, claiming that it was another way to silence their voices. The event also garnered a small group of protesters outside Lerner Hall. Six protesters from RefuseFascism.org, an outside activist organization devoted to opposing the Trump administration, held signs that read “Ann Coulter = Fascism” and “Protest Ann Coulter.” The group objected to Coulter’s presence on Columbia’s campus as well as her conservative views. Protesters argued that the University had deliberately limited their capacity to challenge the speakers, pointing to the restriction that signs must be 8.5 by 11 inches or smaller within the event. During the debate, Coulter and Kaus, who both voted for Trump, discussed Trump’s hard line on immigration and promise to build a wall as the specific parts of his platform that they liked. Coulter is famous for her book, “In Trump We Trust,” in which she urged Americans to vote for him. The two have since turned against him, saying he hasn’t delivered on his promises and has sided with the establishment candidates he once condemned. However, neither of the two speakers said they regret placing their trust in Trump. “I regret nothing. … I’ve been waiting 30 years for people to say all these things. ... I knew he was a shallow lazy ignoramus, and I didn’t care,” Coulter said. “He’s saying what I wanted somebody to say. What I’m disappointed in is he’s doing everything ‘Jeb-exclamation-point’ and Marco Rubio said they were going to do,” said Coulter. Kaus’ focus during the discussion was almost entirely on immigration, basing his support for Trump on the President’s intention to return job opportunities to working-class Americans. Kaus believes an increase in immigrants and refugees, legal or otherwise, would decrease the amount of jobs available for working-class Americans, a trend he believes Trump is capable of reversing. Similarly, Coulter advocated for an immediate moratorium on immigration and believes all “current immigrants” should be fully assimilated. She warned against the dangers of immigrants voting along the lines of ethnicities rather than actual policies. Both Coulter and Kaus asserted that all immigration is bad for Americans and the economy, irrespective of whether the immigrants are admitted under H-1B visas, as unskilled laborers, or for professional or educational purposes. According to Coulter and Kaus, every job taken by an immigrant could go to an American. The pair claimed that immigrants take advantage of the system by bringing their family members to the United States as well. Coulter suggested that immigrants commit Medicare fraud and take advantage of Social Security, to the detriment of American citizens. Further, Coulter critiqued the protest culture that has been prominent recently on college campuses, calling it unnecessary and incapable of real change. She cited in particular 1968 student protests and their failure to end the Vietnam War. However, Kaus disagreed, saying that the student protests pushed Nixon to his policy of Vietnamization and ending the draft. CUCR’s next event with be a panel on national security with former Deputy United States Military Representative to the North Atlantic Treaty Organization Blaine Holt and Army Sergeant Dan Prince on April 4.